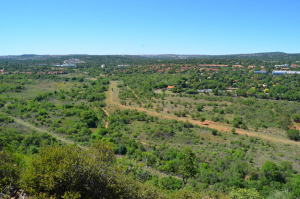 Faerie Glen Nature Reserve is situated at the western limit of the Bronberg in the east of Pretoria, South Africa. It formerly formed a part of the farm Hartbeespoort 304 which belonged to H. W. Struben. On old aerial photographs it is apparent that the flood plain was utilized for crop fields, while the remainder was used for cattle grazing. The reserve constitutes the western part of the Bronberg conservation area, which was declared in 1980. Its highest point is Renosterkop (1,468 m) in the northern part of the reserve. Though the smaller mammals like mongooses, hedgehogs, hares, porcupines, Cape clawless otters, bushbabies and small-spotted genets are difficult to observe, one may find signs of their presence. In the winter of 2014 larger game was introduced, namely 16 impala, 9 red hartebeest and 5 Burchell's zebra. During late 2014 one common duiker was released in the reserve, the first spotted eagle-owl house was installed, and a first sighting of caracal was made. The leaf-feeding thrip Liothrips tractabilis, introduced from Argentina, was released in the reserve's flood plain in 2014 to combat the invasive pompom weed. Some 150 bird species have been recorded in the reserve. In terms of breeding habitat the grassy floodplain along the Moreleta spruit is especially important for a number of cisticola and widow species, and the riparian vegetation provides breeding habitat for a number of weaver species. The bushy slopes provide foraging habitat for boubous, tchagras and cuckooshrikes, while nightjars emerge at dusk to forage over the slopes and floodplain.